Public Domain and Fair Use: Recognizing this important link between incentives and innovation, the U.S. Constitution allows Congress the ability to provide “inventors and authors” limited monopolies on the works that they create. While copyrights guarantee exclusivity, the rights have always been tempered by the Fair Use doctrine, which allows the use of copyrighted materials under certain circumstances. Additionally, once copyrights expire, the material falls into the public domain. To ensure robust innovation and creativity, copyrights must work in conjunction with fair use and a robust public domain. You Buy It, You Own It: Technology is change fundamental concepts of property rights and ownership, and the advent of the Internet of Things is only going to complicate things further. In today’s world, many products that we buy include embedded software, which muddles the question of ownership. Yes, you own the car you purchased, but does that give you the right to tinker with it when it is controlled by software that has its own End User License Agreement that stipulates you cannot tamper with it? Moving forward, copyright laws must be balanced with the fundamental question of what ownership means. Transparency: It should be remembered that copyright ultimately is a form of federal regulation established in the Constitution to promote innovation. Like most regulations, it is susceptible to capture by the regulated community. Just as the administrative state has grown over time, so, too, has the intellectual property regime. Copyrights and patents have expanded in both quantity and duration and today they may be just as likely to thwart innovation as to promote it. To limit the possibility of regulatory capture and another SOPA and PIPA battle, future discussions of copyright reform must be transparent and open, allowing broad public participation in the debate rather than closed door deals with special interests. 21st Century Creators: Like many other liberty-minded groups, FreedomWorks opposed SOPA and PIPA for their draconian measures. And while the netizens uprising won the day, the issue has not gone away. Large internet companies remain locked in a standoff with the traditional content creators represented by groups such as the Recording industry Association of America and the Motion Pictures Association of America. Yet in the wake of the tech revolution and the creation of the internet, a new type of content creator has emerged, one that does not necessarily align well with these earlier models of content creators. Moving forward copyright laws must strike the appropriate balance for all content creators and harness the power of technology and the internet to foster innovation and all types of content creators. Free Speech: Finally, the internet has significant implications for free speech online. From actions by the Federal Election Commission to define political speech, to overreaching legislation like SOPA and PIPA, free speech online faces regulatory and legal challenges. Speech is protected by the First Amendment, and any efforts to reform copyright laws cannot infringe on these rights. 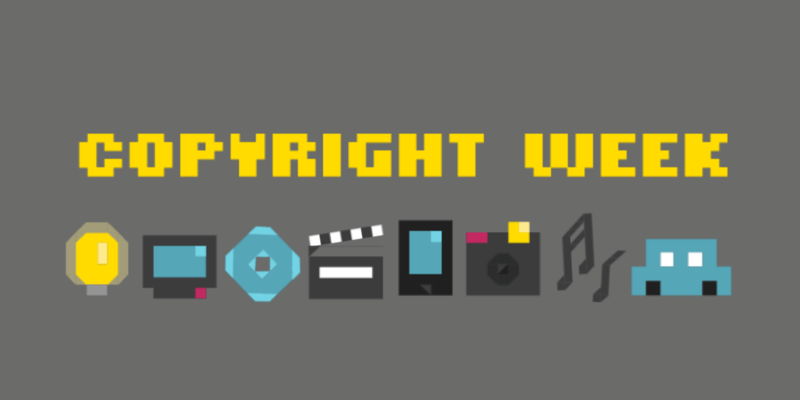 To find out more about these important issues and the issues surrounding copyright reform, check out the Copyright Week web page.